The major focus of this release is a set of new privacy features. Driving this focus is the imminent implementation of the GDPR, Europe’s new privacy and data protection regulations. These regulations apply to any organization or business operating in Europe or serving individuals in the European Union, so it has a global impact. If your organization is based outside of the EU and you’re not sure whether GDPR applies to you, read this to find out more. New section added to the donation form. The terms and conditions can be toggled to display within the donation form. Bonus tip: You can now access Charitable’s Customizer settings directly by clicking on the Customize link in the Charitable dashboard menu. WordPress 4.9.6 was released earlier this month and included a few key tools required to help WordPress websites comply with the GDPR and respect their users’ privacy rights. Our team contributed to the WordPress 4.9.6 release and we have been steadily preparing Charitable to integrate with those tools. Charitable also helps you respond to your users’ requests to access the personal data held on your website by including any data collected by Charitable in the export tool (available at Tools > Export Personal Data in WordPress 4.9.6). If users request to have their personal data erased, you can also have the data collected by Charitable erased. However, since your country may also have a legal requirement for you to retain some data related to donations for a certain amount of time, Charitable provides you with fine-grained controls over how long data is retained, and which data can be erased earlier. You will find these settings by going to Charitable > Settings > Privacy. By default, all personal data stored for donations made within the last two years will be retained. Personal data is not automatically removed when the data retention period is passed; it is erased when a user specifically requests to have their data erased. Refunds aren’t much fun, and hopefully you don’t need to issue them very often, but with this release we have tried to make it a little less painful to issue refunds for your Charitable donations. Marking a donation as refunded. You can now mark a donation as Refunded via its details page and have it automatically refunded with PayPal. 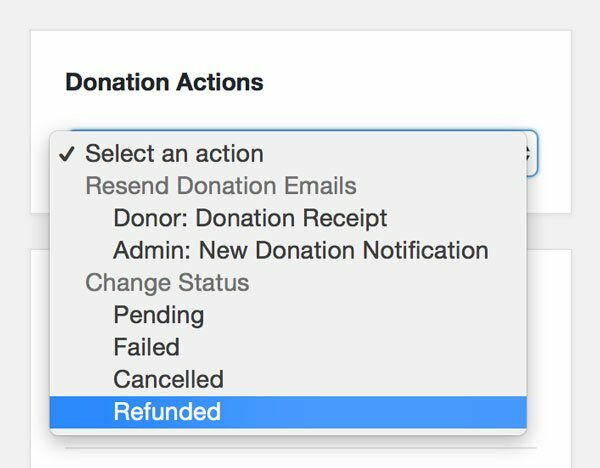 Just select “Refunded” in the Donation Actions meta box and choose to have it refunded in PayPal immediately; Charitable will take care of the rest. [charitable_stat display=donors] have raised [charitable_stat display=total] to support our work. Click here for the full guide to using the Charitable Stat shortcode. Charitable has long included a donations export, but we lacked a similar report for campaigns. As of Charitable 1.6, that problem is solved. Go to Charitable > Campaigns and click on the Export button to download a CSV file with all your campaigns, optionally filtered by date and status. This release adds a few new features and refinements for developers creating fundraising experiences with Charitable. // Define a new field. Using Ambassadors? Keep an eye out for the next major release to add support for the Campaign Fields API. // Get the field through the API. // Update the 'label' setting of the 'donation_form' argument. If you haven’t already, update Charitable via your dashboard today, and tell us what you think. Thank you to everyone in the Charitable community who provided the feedback and feature requests that led to the changes in Charitable 1.6. User feedback has consistently played a huge part in helping us decide what to focus on in Charitable’s development, and this release has been no different.